Uncategorized | Life Long Learning! As we explored the impact of Web2.0 technology, I assigned the students to create either a blog or a wiki. They were also assigned to create a post making some connection to what we discussed in class with regard to teaching theories. (It was only a four week class, otherwise I would have required more posts, but with the other required work – I felt that would have been unrealistic.) I hope that this exposure to using blogs and wikis inspires these students to use these kinds of collaborative tool with their own students once they get into the classroom. The final project for the class was to design a project based unit plan. Along with their unit plan, they needed to select a set of web resources that would enhance the unit, or help the students research the information they needed to complete their projects. Overall, they did a great job of selecting websites and annotating them. You’ll find their list of resources on their blogs and wikis. I’ve been tagged. How pathetic is to be asked to be tagged? Oh well…thanks Carol Broos for passing this on. Teaching is a second career for me. I have an associates degree from a trade school in fashion merchandising. I worked for Marshall Field’s (now Macy’s) for 10 years, working my way up from stock person to the buying office. (I bought stationary, greeting cards, and flowers). My last position was in 1990 was in a newly created IT department, training buyers on a system of automating purchase orders. I hated it. I swore I would never work with computers for as long as I live. I am an only child. My mom was an only child, and so was my dad. Even though I did not grow up with influences of siblings or even first cousins, my maternal grandmother had 4 brothers and sisters whom she was extremely close. I grew up with the love of many aunts and uncles. I saw all of them every Saturday night when they came to our house for a weekly poker game. When I was a young girl, I wanted to be a dancer. I took ballet, tap, and jazz dance lessons from age 3 until after high school. In fact, I was registered to go to Columbia Collage of Performing Arts right after high school. My life got side tracked when my father was diagnosed with terminal cancer. I still love to dance, although I’m pretty out of shape, but as soon as they come up with Dancing with the MIddle Aged Teachers, I’m there! When I was 24, I was in a serious car accident. I was hit head on by a drunk driver. My leg was broken in 3 places and I had surgery to repair it with a rod, pins, and plates. To this day, I suffer the affects with arthritis in my joints in my right leg. I married my high school sweetheart. I met my husband Jeff when I was 15. My friend’s boyfriend fixed us up because Jeff had a car and would have been able to drive on double dates. That other couple broke up a couple weeks later. We got married after dating for 9 years, and have been married for 22 years. I love dogs. I grew up with a german shepherd named Kim. After Kim, when I was a teenager, I had a schnauzer named Max. My husband is not a dog person, but after 20 years, we finally got a dog. Her name is Tillie and she is the coolest golden doodle dog ever! My dream job would be as a college professor. I didn’t get my college degree in elementary education until I was in my mid 30’s and I think that because of that, I have an enormous passion for learning and a great deal of empathy for learners. Even then, I knew at that time that someday, I would be a professor. I have a great deal to learn before I can do that though. My shorter terms goals are to someday be a school principal. So there you have it….a few things about me. It’s been really fun learning about all of us. Check out this wiki to find out about others in our PLN. I’m afraid that I’m running out of people to tag. How about Ken Shelton, Mrs. Durff, Pam Eder, Julie Squires, and Shannon Smith. If you’ve been tagged already, pass it on. As far as students being responsible for writing a bibliography, there are a couple of ways to look at the issue. First of all, the point of the bibliography is to site the sources used in the information presented. If the teachers provide the sources, then the sources are known. Does the student use all of the sites that are offered? If not, then which ones? 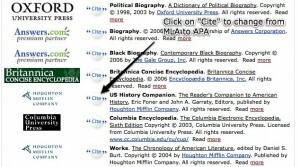 Do the students know how to identify the information required for the bibliography? Do they know where to find it? I will say this: Creating a bibliography from scratch is RIDICULOUSLY LABOR INTENSIVE for little kids who don’t know a domain name from a carrot stick, and who can’t type more than a word a minute. If the teachers are unenthusiastic about doing a bibliography is because one has to weigh the effort/time issue. 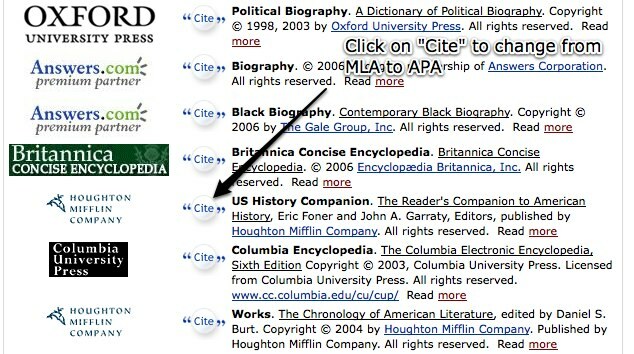 It can and does take an entire class period to find and type the information in the bibliography. Here’s a thought: Very often websites and legitimate research provides a “site source” at the bottom of the page. One example of this is Answers.com. All articles from Answers.com have a “Site Source” list at the bottom because Answers pulls from several different research resources i.e. online encyclopedias. When one uses information from one of the many articles, he needs to use which ever one in the list he took the information from. Then all he needs to do is copy and paste the source because all the information is already put in the proper format for a MLA or APA bibliography (it’s indicated). (See Picture attached.) That was a long way of saying that maybe when sources are provided for the students, copyright information could also be provided for the students so all they would have to do is copy and paste the information like from Answers. EasyBib – this is the preferred tool because you can complete the entire bibliography and then download the complete sources sited document. OttoBib – enter the ISBN of books and the generator creates the bibliography entry – this is great!!! Of course then the student has to be able to identify all of the required information to fill in the fields and then take the time to type in the author, date, sponsoring organization, etc. I’ve taught kids to identify those components and copy and paste as much as they can to save time. The Cool Kids Use Macs! I voted for Obama. I have lots of reasons why I think he’s going to make a great president. Typical Mac user – I have a real affinity for other Mac users. I wish I could say I was an expert because of my personal experience, as some of my PLN blog with their class every year on a daily basis, but I can say that I’ve done a great deal of research. I have done numerous workshops with teachers, and administrators about the process and am happy to say that they have been influential. Here’s my page of presentation materials (although I’ll admit the examples are out of date), Blogging in the Classroom. Recently, I came across a nice post from another educator, Patrick Higgins that pointed me toward some empirical data that supports how useful blogging can be in the effort to improve writing. Drexler, Dawson, and Ferlig’s research paper also covers concerns such as time commitment and keyboarding skills, so it’s worth a careful read. Teachers have used blogs as a means to developing writing skills for a while now…what’s holding you back? …is quite different than hearing it. Speeches are really meant to be heard. The speakers mannerisms, voice, and body language is part of what helps the viewer understand the message. But what if, after the speeches have been heard, we could analyze their words in another way. Wordle is an application that counts the frequency of word used in text and presents the words in different sizes based on the frequency of use. Here is Barack Obama’s speech from the Convention. Looking at his speech this way, what evaluation can we do about his message? Comparing it to others’ speeches, can we more effectively compare the messages of each of the speakers? I used a custom page and webpages. The application also allows the use of PowerPoint. Thinking about the possibilities….